Coco Real cream of coconut is made with 100% real coconut meat, not just coconut milk as in similar products, which produces only the best, top-selling, and naturally-delicious pina coladas and tropical-flavored mixed drinks! To make the ultimate pina colada, add 3 oz. of Coco Real to 3 oz. pineapple juice, 1.5 oz. rum, and 1 cup ice. Blend until smooth and garnish with a slice of fresh pineapple! Smooth and luscious, it's also great for specialty hot drinks or sweet smoothies at your coffee shop. Excellent for baking applications, use cream of coconut to delight your patrons with pina colada cupcakes and other sugary-sweet desserts! I have purchased this for many years. For the lack of a better word, this is a meaty product , meaning that the largest ingredient is not water or sugar, but instead it is the actual coconut meat with the juice pressed out and added in. Use it sparingly as it is fairly concentrated and can readily overpower an accompanying ingredient such as the Pineapple in a Pina Colada Smoothie. Coco Real Cream of Coconut makes professional bar quality frozen cocktails consistently every time. Being in the profession for more than 30 years I highly recommend Coco Real Cream of Coconut. This Coco real cream of coconut is so thick and delicious with real coconut flavor!! This stuff makes the best Pina Coloda's!!! I will be buying much more of this! I have several recipes that use Coco Real Cream of Coconut, but I don't often buy it because it cost at least twice as much anywhere else. I was pleased to find it at the Webstaurant Store. This is a delicious product when used in pina coladas. It makes the drink a smooth and cream drink with the real taste of coconut. A little too sweet for my taste, it reminds me of canned coconut milk which is also thick like sweetened condensed milk, I was actually hoping for more of a coconut flavoring for my coffee because I don’t always have fresh coconut milk on hand. It does have an authentic and great, distinguishable coconut flavor though. Coco Real 22 oz bottle of cream of coconut is a great addition to your bar to make coconut drinks with especially blended coconut drinks. It has an amazing creamy coconut taste. This stuff is SO good! Perfect for so many uses! Mostly we mix it into our buttercream for a perfect coconut flavor but can be used in drinks, as a syrup, over ice cream as a flavor syrup for desserts and so much more. Will definitely order again! Lightly sweet, very coconut-y taste. It's very thick, especially when refrigerated which makes it a bit difficult to mix into drinks. Works well with any drink that needs some coconut and sweetness! This is a really good coconut cream for making pinacoladas. It is a really thick cream so you get a nice creamy texture. It is nice to have the convenience of the squeeze bottle. Coco Real Cream of Coconut is really delicious and easy to use. We use it to make the most delicious and tasty Pina Coladas, Lava Flows, and Blue Motorcycle cocktails. Taste is good. A bit on the sugary side tho. Would like it even better if it was creamier. Will have to try a few other brands before I settle. Bought this here for around half the price of what they have it at my local restaurant supply store. I actually prefer the taste and consistency of the canned coconut, but this is great for quick drinks when you don't want to go through a whole can. This cram of coconut is a great product! Taste just like coconut and has a nice texture. Will definitely purchase again for my soda shack. Thanks Webstaurant Store! This is flavorful and good for mixed drinks. It is thinner than the canned cream of coconut so if you plan to use it for icing or candy making, keep that in mind. I love a great coconut flavor in baked goodies and this stuff is really tasty! Particularly good in coconut-macadamia pancakes to add that extra tropical kick. A lovely tasting cream of coconut puree that is very fresh and flavorful. Great for adding to hot tea or mixing into cocktails for a nice treat. The coco real cream of coconut is deliciously extraordinary. Very impressed with the quality and taste. A nice product for flavoring any cocktail like coconut. yum, nothing better than cream of coconut! this stuff makes amazing coconut cake and coladas. and it doesn’t need refrigeration, saving valuable refrigerator space. and it’s easy to dispense, unlike those messy cans. This is the same stuff that is available at my local restaurant supply store, it works great to add that coconut flavor to drinks and give it a creamy consistency without the use of milk, plus its half the price on here! It was amazing product. The richness of the orange scent and flavor gave me a richer accent in my cocktail. Delivered safe. Thank you for nice handling. Best cream of coconut we've tried!!! Absolutely AMAZING! Makes you pina coladas perfect and creamy. Great flavor and easy to use. Just open the cap and squeeze. This tastes soooo delicious. I make an egg cream soda with it. I add some cinnamon powder and vanilla extract and that is my summer drink! It's thick and sweet! The bottle's size and shape make it very convenient! Great product for adding some pizazz to cocktails with little effort! We especially love the coconut in margaritas! The squeeze bottle also makes for sticky free hands! cant say enough good about this product. amazing taste, blends easily, add it to almost any kind of drink/recipe and its a piece of heaven! I actually used this cream of coconut syrup a lot more than I thought that I would. It is really good and it is good for mixing into some drink recipes. A really thick and luscious tasting cream of coconut that will really transform the taste of your cocktails. A great quality and terrific smooth texture. 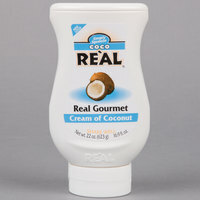 Coco Real Cream of coconut is a great product to add a wonderful coconut flavor to just about anything. I love it for cakes and frosting! The Coco real cream of coconut is tasty and very fresh. The cream can get thick after storing in the fridge, but the flavor is incredible. I love using this to make coconut shakes. This coconut cream tastes amazing! I bought this to use for my receipes that require coconut cream such as coconut cream curry and it comes out great! Great convenience! This is a wonderful coconut purée. We use it in our coffee shop in our smoothies & specialty coffees. Our customers really love how it tastes. The coco real cream of coconut syrup is rich and creamy. A great way to add a hint of coconut to lemonade and teas. The bottle is easy to handle and stores well. I love this cream of coconut, it's so hard to find but there's really nothing else like it (not every grocery store carries it, but check the alcohol aisle near the mixers). It's great in tropical mixed drinks or drizzled on top of desserts. It's the key ingredients in my mom's sweet mango sticky rice! The coco real cream of coconut drink mix is very thick and creamy. It make a wonderful pineapple coconut smoothie. It gets a tad thick in the fridge, but it has a wonderful taste. I love this product! I use it in my smoothies and drinks and it's really delicious. It has a great coconut flavor but not overpowering . I love this coconut cream. I used to use a canned coconut cream that would quickly harden, until I discovered this product. It's always creamy and doesn't lose taste for a long time. I love real fruits mixes, so I decided to give the coconut a try. It is way too thick and looks like a gels instead of a smooth liquid mixture. It is very difficult to incorporate into drinks. I would look elsewhere for coconut mixes. Thank you for your feedback, Jonathan! We are sorry you did not prefer this coconut mix, for recommendations please contact our Customer Solutions team. The huge seling point in this product over some of the other cream of coconuts is that its resealable. No more spilling coconut milk all over your fridge! Great product that's almost half the price of purchasing it retail. This is great for Pina Coladas, and is shelf stable requiring no refrigeration, and doesn't separate! I have a lot of baking recipes that call for this cream of coconut. It is a thicker sweet coconut flavored syrup. I like that it comes in a squeeze bottle as oppose to a can so you can use only what you need. Our business has used the Real line of products to make awesome frozen beverages such as daiquiris and margaritas. They work well and are reasonably priced on Webstaurant. We will continue to use them. one of the best flavors out here, adults and my kids love this product I use it all year long...glad I found this last year. This Cream of Coconut works well for Pina Coladas, however it has separated and with a full container it is hard to re-incorporate the solids by shaking alone. After using about half of the bottle a good shake before using serves to mix the contents well. The consistency of this is that of a body cream or thick lotion. Perhaps it will soften up if used frequently or in a warmer kitchen, but for now, it doesn't mix well in drinks. It kind of sinks to the bottom. The flavor is delicious, so I am sure it would be good in baking and blended drinks, but be aware if using it for other uses. Perfect for quick use, taste is great and the container stores really well in the ice box. The labeling is very legible for quickly finding it. I ove the coconut tast and sweetness that can make quick non alcoholic drinks and doesn't require it to be refrigerated at all for my convenience. Wow, you guys are fast! This was my first order with you, but it won't be the last. Ordered on Thursday and delivered on Saturday and was packaged very well. We use this cream of coconut in coffee and in mixed drinks as well. It is very creamy and easily mixes in, unlike the thicker cream of coconut from a can. The flip top squeeze bottle is also very convenient to use. Thanks for the great service! Pure coconut flavor and quality at its best. Great in a curry sauce, for pina coladas, or for a rich and flavorful smoothies. For any recipe that calls for a very rich coconut flavor, Coco Real is the best choice!!! This Coco Real 16.9 fl. oz. Cream of Coconut has a great taste and has a good shelf life. The consistency is very smooth and creamy. With the price, you really can't go wrong. Smaller than the 64oz, bough this smaller version due to the larger being out of stock. The cost difference is pennies on the dollar for a much more convenient hand held size. Stuff is a little sweet, BUT it pretty spot on for a coconut cream item with a stable shelf life. Great flavor rich coconut flavor. It works well for drinks or whatever you may need to flavor. Would recommend it to someone and we will be ordering it again! This is the real stuff at a super bargain, we go through at least 2 of these a week and you can actually taste the coconut. Love the fact that I can purchase this product from this site in a plastic squeeze bottle instead of the usual can at the grocery store. Great price too! This stuff has a very nice strong Coconut flavor, and it's sweet, so makes your cold cafe drinks and smoothies really pop. We love it in our tropical smoothies. What a delicious addition to mixed drinks! It gives an "island feel" to any ordinary drink. You will not be disappointed with a drink made with this product. I like the quality of this cream of coconut but the manufacturer needs to find a better package to dispense it. It is very thick and the bottle opening is not very wide so no way to scrape out the contents. I feel like alot goes to waste. This is a great product. Definitely one of the best coconut creams on the market and you can't beat the prices at the Webstaurant Store. Great Cream of coconut I love that it's made using all real coconut. I use this to make coconut candies. It gives them a great coconut flavor. Love to enhance the Finest Call Pina Colada mix with this. So creamy-ly delicious! Also love the fact that this is in a squeeze bottle so it requires very little effort. Great flavor, creamy, essential ingredient for coconut cakes! and the best price I have found, and any leftovers are great for making pina coladas also! What I love most about this product is the resealable cap. Cream of Coconut is sticky, this type of bottle helps to make it mess free. Fantastic. This Coco Real brand of Cream of Coconut is great to use to make homemade pina coladas. The flavor is more powerful than a jug of pre-made mix. Cream of Coconut is an essential ingredient in several delicious drinks, most notably the Pina Colada. I like the Coco Real brand because it comes in a squeeze bottle and can be stored in the fridge after opening. We use coconut cream in our pina coladas, it really gives it a great coconut flavor and a really enjoyable creaminess. It can be used in both non-alcoholic and alcoholic coladas. SO delicious!! Works well in pina coladas coconut cream pie and in german chocolate cake!! Such delicious and makes everything very smooth and creamy consistency!